2018 in Review 2019 in Focus! First of all, G & I are so thankful for all of our S4E customers. Each and every one of you are awesome. Our goal this year was to do one show each month and we made it! Some months we actually did two or more shows. We are so thrilled about making our goal for this year and want to thank our customers because we wouldn’t have made it without each of you! We have set our goal for next year and it is to have our goodies at more locations! If you know of a beauty salon, barber shop, gift shop, etc. that would like to carry our goodies-let us know. Thank you to those of you that have requested special orders of new fragrances, some of those have been selected to be part of our regular line up! It’s great to get special requests because we know for sure that our customers will like the end result. Hey all you S4E customers! We are excited for this holiday season and are busy preparing fun soaps, lotions, bath bombs, and maybe a surprise product. If you are wanting something special, send us an email and maybe we can help. Here’s a fun fact! We were trying to be really creative when making this snowman soap. We even drew out our thoughts of how we wanted it to look. Take a look and see what you think. Snowman soap. This gem is scented with Fresh Snow for a crisp clean scent. Every little adornment from the arms, buttons, eyes, nose, scarf and hat are made from soap dough. We had a lot of fun with this one. Hi S4E friends! We did it! We made Cherry Almond soap again! This year they are a bit bigger because we got a new mold. We are using one in our shower just to be sure they are perfect quality for ya. We will also have Cherry bath bombs and Cherry Almond lotion available. We hope to see you all at The Cove Cherry Fair! It's right outside La Grande and will be going on all day Saturday. So if you need something to do, come on out and see us! We now have a customer loyalty program for Whipped Lotions. With each 5 oz. lotion purchase you will receive a star. Once you have 10 stars you will receive a FREE 3.2 oz. lotion or $7.00 credit toward your next lotion purchase. Soaps will continue to have Buy 4 Get 1 FREE special. Bombs will continue to be 4 for $10.00. Figgy Pear is a fun mix of Autumn Fig and Crispy Anjou Pear oils. The combination of the two has been a popular mix from many different bath stores. S4E makes Figgy Pear Sugar Scrub, Whipped Lotion, Lotion Bar, or Oat Almond Milk soaps with this delightful mix. Close your eyes and envision a sweet concoction of delight. 2018 is a year of growth for S4E! We are so happy to be in business and continue to serve our customers and have fun while doing it. We're working on a couple new venues this year to showcase our products and vendor shows. AND we deliver often to neighboring areas! S4E SHIPS anywhere in the U.S.A.
S4E has had many vendor events to date and we expect to attend many more. We are really having a great time networking and getting to know other vendors. Our next show is going to be in Milton Freewater at the Stateline Church. It is a benefit for police and firefighters and is called Guns and Hoses! If you have time come on out to see our setup and available soaps, lotions, and bath bombs. In Soap, Bath Bombs, Lotions Tags GunsandHosesbenefit, OatAlmondMilkSoap, Lotion, BathBombs, Vendorevent, Saturdayshow! Well it's here again. Valentine's Day! I must admit I was not much of a Valentine's Day fan, until recently. I have my favorite valentine now (my G) and a super fun creative outlet (S4E). S4E has been great for my creativity. We have been prepping for Valentine's Day for a couple of weeks now and are clearing out Christmas and Thanksgiving soaps. Mad Love is a wonderful sweet fun bar. I love the scent Hello Sweet Thang, I've been trying to find a bar that would be perfect for this scent and I think this is it. It makes me smile. I wanted to put soapy Sweetheart candies on it but made fun flowers and hearts out of soap dough. I've been messing around with making soap dough and have made cute little bears and carrots and flowers. I am trying to perfect it. I suppose as I continue it will get much better. Time will tell. Strawberries and Champagne is a fun bar with a pink glycerin heart embed in the middle of it. It's fun too and smells fruity bubbly! Sunset Orange is me trying to do Ombre' type soaps. I did ok for the first batch and then added in a Clementine Cupcake scent which has a bit of vanilla in it to the next batch. I found out again this way that anything with vanilla in it will turn brown in cold process soaps. :/ Oh well. I know what to do for the next batches! It's super fun and I just love orange. It's my favorite! I just love fruity soaps. Saucy Santa/Winter Mint- This is a delightful combination of mint, frosted berries, cinnamon and nutmeg. Cinnamon Sugar- This smells just like those cinnamon pine cones you smell as you walk in stores during the holidays. Cinnamony Goodness topped with raw sugar crystals. Figgy Pear- A blend of Autumn fig and Crispy Anjou Pear smells fresh and fun. Holiday Spice- We took a blend of spices you can use in food and put it in soap. It contains cinnamon, allspice, clove, lemon and orange peel powders, and sugar. A bit of orange essential oil was also added to give it a bit more orange smell. Apple Pie- Hot Apple Pie fragrance oil with cinnamon swirled through the loaf creates the mild exfoliation you could be searching for. Smells just like Apple Pie. Clove- Men requested Clove soap and so we made it! Clove Essential Oil with ground cloves swirled throughout. Ground Cloves can also be a mild exfoliant. Pumpkin & Brown Sugar- If you are a pumpkin fan you will love this bar. Pumpkin & Brown Sugar Fragrance Oil is in this loaf. Black Friday we will be in Walla Walla at the Fairgrounds for An Enchanted Evening. Saturday we will be there all day! Come see us and smell our Holiday line of soaps. The Enchanted Holiday Market at the Fairgrounds in Walla Walla Black Friday and Saturday! This is our first show in Walla Walla and we are anticipating many more. Come see us if you are out and about. Friday is ticket only with special perks and Saturday is 9-5 and is free! Holiday Bazaar at the new Life Center Church in La Grande! Saturday December 2, 2017 from 8 am-4 pm. Santas coming to town for Archer fundraiser at the Riveria Activity Center in La Grande December 9th from 9-3! S4E is gearing up for the upcoming holidays. We want to be sure we have enough for everyone that needs gifts or just wants a little pleasure for themselves. Cinnamon Sugar, Pumpkin and Brown Sugar, Holiday Spice, and Saucy Santa! Cinnamon Sugar is topped with green jojoba beads, turbinado sugar, and red cranberry seeds to complete the festive colors! Pumpkin and Brown sugar is a swirled pretty bar. The combo of scents is just pleasing. Holiday Spice is a mix of orange essential oil, Allspice, cinnamon, cloves, sugar, and lemon and orange peel powder all mixed together in the soap. Saucy Santa is mint, clove, cinnamon, and frosted berry combination. It is refreshing. We take special orders for those that can't find that certain soap they want. Most recently I've made a Lemongrass soap and I am working on a Fig and Pear soap for special requests. My favorite of late is Ginger peach! I love this scent in candles, I thought why not put in a bar of soap? For special requests, allow 4 weeks because all the soaps are cold process and take that long to cure. Gift baskets are also available. I can make specifically to your request of what you want in the basket. Upcoming Cove Cherry Fair - Saturday August 19th! Hi fans! S4E made special Cove Cherry Fair soaps scented with Cherry Almond fragrance oil. They smell just like cherries. S4E will be at the fair starting at 8 am Saturday morning. Come visit us to see all our handmade soaps and bath bombs. S4E has been working hard at stocking all the soaps we offer and preparing for shows that are soon to come. Friday July 21, 2017 at Rivera Activity Center there is a show for Ladies Night Out and then August 21, 2017 and the Cove Cherry Fair. Both seem to be great shows and we are excited to participate. We've made soaps, lotions, and bath bombs by request with specific fragrances. Auquolina Pink Sugar and Philosophy Pure Grace are two new additions to the inventory and both smell amazing. We're thinking of going to Farmer's Market sometime this summer also. An exciting thing that seems to be a hit and taking off is gift boxes by request specifically made to order. Check out the gallery to see what some of the boxes look like. NE Oregon Bridal Show in one week! Something For EveryBODY will be displaying and selling soaps and bath bombs at our first booth next Saturday! S4E is frantically working on display techniques, signage, and more bath bombs. S4E plans on having the following soaps available for customers to purchase: Peppermint, Peppermint Foot Scrubby, Lemon Calendula, Sandalwood, Green Tea & Cucumber Loofah, Mimosa, Energy, Warm Vanilla Sugar Turtles, Tactically Clean, Unscented, Island Coconut, and La Grande Honey. Grapefruit Bellini Champagne soap with rose petals will be ready for purchase in travel size. $1.00 show price only. Also, the introduction of Suit & Tie, a man's soap will be occurring at this show. Scented with Beau Brummel Cybilla fragrance oils- Tobacco and black tea are the dominate notes with hints of fruit and spice. This fragrance is heady, masculine and evokes images of the classic well dressed gentleman, Beau Brummel. Come smell the new scent. Lemon Whip- It's a bar of soap and it FLOATS! Scented with Lemon Verbena Fragrance Oil, this bar has the best lemon scent. Lemon Whip, Suit & Tie, and Grapefruit Bellini Champagne will be available to purchase. Oh one more thing. S4E made heart travel size soaps in Lavender and Coconut Cream for giveaway prizes! Make sure you are one of the first 40 attendees to walk in the door and you will get a free heart soap! S4E will be prepared to take custom orders for those that wish. 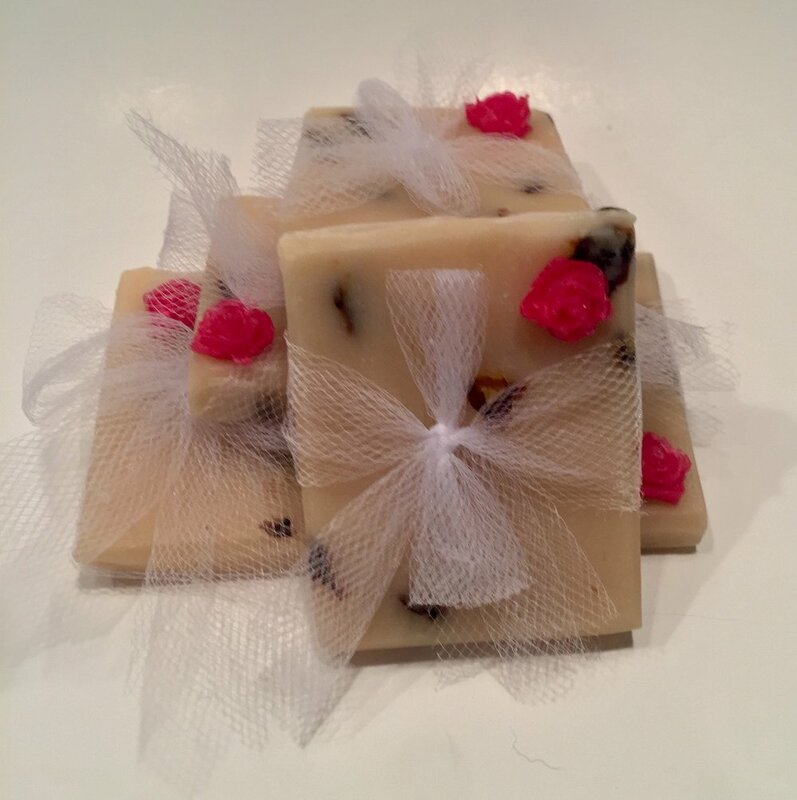 Cold Process soaps need 4-6 weeks to cure so make sure to place your orders for your bridal events, baby showers, anniversaries, or any other special events. hi all! I've been working hard on Easter soaps. So far, Grapefruit Bellini Easter eggs, bunny's, and round bars with bunny's on them are done. They are looking so good and I can't wait to post them for everyone. All my soaps are made with natural oils and butters. Adding a little fun to the mix is good too. The dinosaur soaps for kids were a hit and hopefully the Easter soaps will be also. Have a good day everyone. PS I am also going to make some easter egg bath bombs, just for fun. Just received word today that I will be able to attend and have a booth at the NE Oregon Bridal show in La Grande, Oregon this year. I am so excited. For one, I will get to see all the other booths and then my soaps will also be available for sale and then possible orders for soap bridal favors. Maybe I will see some of you there. The start of a good thing. Something For EveryBODY was created to spread the love of all natural handmade products. I started with soaps and am gradually including other products like bath bombs, lotions, etc.